RSS feeds are geeky so we will try to explain them in very simple terms here....RSS feeds are a way to automatically follow the latest updates to a website. Most good websites are updated on a regular basis. Blogs have new posts written, journals have new articles published, Physiospot has new content added on a daily basis, Physiopedia is updated on a regular basis, these are just a few examples. These websites will all have an RSS feed. The RSS feed of a website may be represented by any of the symbols in the image on the right. That RSS feed automatically contains all the latest updates from the website. To find the RSS feed on a website look for one of these orange symbols, or they might be tucked away somewhere on a page titled: subscribe, alerts, rss etc. To use the RSS feed to your advantage, i.e. automatically be informed of new updates, you will need to subscribe to the RSS feed with a RSS reader (or aggregator). 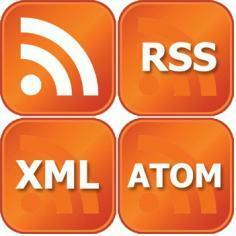 To follow RSS feeds of your choosing you will need to subscribe to the RSS feed. To do this, you must use an RSS reader (or aggregator). An RSS reader/aggregator is an application or website that collects all the updates from any RSS feeds that you have subscribed to. You will need to actively visit this application or website. Go to the the website of the that you wish to follow and open it your browser, then copy the URL (the website address) in the web address bar at the top of the page. Check a folder (or create a specific folder for the topic of this rss feed) and click "Add"
Any new updates to this website will then automatically appear on your Feedly page. Do this for each of the websites for which you wish to follow their updates. N.B. If you don't have a gmail address and don't wish to set one up we recommend that you use Netvibes. You can create feeds in PubMed for a specific search. This is useful if you want to keep up to date with the latest articles published in PubMed on a particular topic you can do a search in PubMed for all the latest articles on that topic and from this search you can create an RSS feed. That RSS feed will then alert you to any new articles that have been published in PubMed on your particular topic of interest. You can create as many of these feeds as you wish making it easy to stay up to date with all the latest research in your specific interest areas.